The passage of the Tax Cuts and Jobs Act (TCJA) in 2017 ushered in a new set of tax rules. 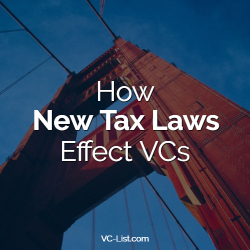 Most of these changes took effect for the 2018 tax year and impact all business and industry types, including venture capital. Venture capital firms primarily earn returns through the capital appreciation of their investments and management fee income. These two revenue streams tie into two major changes starting in 2018. The treatment of capital gains income and management fee expense will be different moving forward. Prior to the TCJA, capital investments received favorable long-term capital gain treatment upon sale if the investment was held for longer than one year. Venture fund agreements often contain carried interest provisions that provide for additional profit allocations if certain thresholds are met- these vary by agreement, but generally are based on the cumulative return on investment. Carried interest provisions are effectively compensating the manager for successfully managing the investment. Instead of additional management fee income, taxed at ordinary rates, the manager receives additional profit allocations (and cash) on the backend. The benefit of this arrangement is that most return thresholds are only met with a liquidity event, like the sale of portfolio stock. If that stock was held longer than one year, the manager receives long-term capital gain instead of the ordinary income that management fees would have generated. Management fees are generally incurred by the fund, paid to the manager, and reported to investors as portfolio deductions. Portfolio deductions also include any expenses clearly and directly allocable to investment or portfolio income, such as accounting and legal fees. Prior to the TCJA, portfolio deductions were itemized as miscellaneous deductions on Form 1040 subject to a 2% adjusted gross income threshold, meaning the expenses needed to be in excess of 2% of the taxpayer’s adjusted gross income. Investors did receive some benefit of the expense, although limited. Following the passage of the TCJA, miscellaneous itemized deductions are disallowed for tax years 2018 through 2025. In other words, taxpayers will receive no tax deduction for the expenses incurred by the fund to manage the investments. Management fee income recipients, however, are still taxed on the entire amount of income earned. This provision does sunset, but provides some incentive to minimize fund level expenses incurred. Managers may want to consider their compensation structures and whether management fee waivers work into the overall business plan. This option does need to be carefully considered and structured in light of the proposed regulations, so it’s more likely that taxpayers will be left wondering ‘what happened to my deductions?’ in 2018.